VBOA 2017 Billing 2016 Report Billing 2015 Report Billing 2014 Report Billing 2013 Report Billing 2012 Report Billing 2011 Report Billing 2010 Report Well it all started for me, Beth, Brandon and my mum and dad early on Friday morning, we arrived in our cars they were as follows: Richard – Lou Beth & Brandon – Cavalier Mk3 Robert & Sue Watt – Cavalier Mk1 We set up the club stand and lined our cars up ready for the arrival of another three members they were Dave Cole – Cavalier Mk3, Andrew Waite – Cavalier Mk1 and Nigel Winter – Cavalier Mk1, after they had set up camp it was time for us all to go hunting around the now famous auto jumble for that elusive part or two. The evening came to an end with us all sitting around the club stand in the gazebo’s talking about almost every subject under the sun and it was quite literally under the sun, this was by far the warmest Friday at Billing I have ever known. 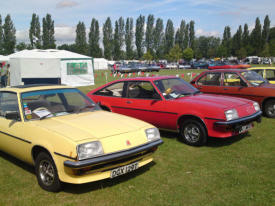 Saturday morning kicked off with the arrival of Kevin Bricknall – Opel Manta, Paul Ellson – Chevette, Ian Broadway – Cavalier Mk1, Gary Williams – Cavalier Mk3 and Bev Williams – Cavalier Mk2. Once we were all signed in we all jetted of in different directions once again straight to the auto jumble, Andrew came back with some very good items, but then again Andrew is a walking talking spare parts number man if anyone needs to know any part number for a car he is your guy. A later addition to arrive was Simon Downs for those of you who have been on our club stand for the last three years will know of Simon, he has been a Manta guy on and off since the 1980’s, he currently has an Opel Manta under restoration and a very rare Opel Commodore A, which is the only one of its type in the U.K, sadly both of these were unavailable to attend the show but Simon still came and shared his humour with the rest of the gang, along with Ian Broadway those two could easily be a great stand up double act. As usual Saturday went by so fast, and soon evening arrived, we had a bbq, before sitting down and chatting away into the early hours, although Gary and Bev took of to see a Queen tribute act but returned to join us for the remainder of the evening. Sunday morning soon arrived and Kevin Bricknall returned in another car it was in the shape of a Cavalier Calibre ( I hope I got that right as he also is the proud owner of a Calibra ) also to arrive on Sunday was Richard Winter – Chevette, Richard Haywood – Chevette, Phillip Scaiffe – Cavalier Mk2, Rob Knowles – Cavalier Mk3, Chris Martin – Cavalier Mk3, Robert Smith – Chevette and Paul Ellson once again in his Chevette and the return of Ian Broadway – Cavalier Mk1, we all got lined up, after a short time it was time for us to make the short trip to the V.B.O.A Main Arena to join up with the Chevette Owners Group to make a nice arena parade, my dad started of the procession with my beloved Copper Cavalier Mk1, followed by the rest of the members you may be wondering where Lou was in all of this I declined the opportunity of taking Lou into the Main Arena parade this year as I wanted to video record the whole parade. Once that was over it was another opportunity for the members to tackle the auto jumble, Kevin this time came away with some very nice parts at very good prices. 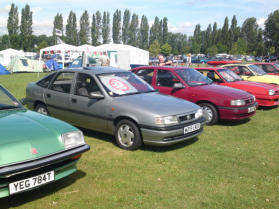 It was soon time for us to vote for the best cars on the club stand and this year was to be very different indeed, I and Beth decided to split up the body types this year such as Cavalier saloon and Cavalier Sports Hatch but to name a few. 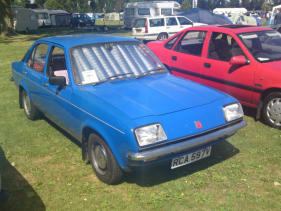 The winners of Billing 2010 were as follows: Richard Watt – Cavalier Mk1 Saloon – LOU848P Ian Broadway – Cavalier Mk1 Sports Hatch – YEG784T Kevin Bricknall – Cavalier Mk2 Saloon – E30FTL Phillip Scaiffe – Cavalier Mk2 Estate - F608HVK Bev Williams – Cavalier Mk2 Convertible – D252FFX Rob Knowles – Cavalier Mk3 Saloon – L106NUG Beth Watt – Cavalier Mk3 Hatch – M219URO Richard Haywood – Chevette Saloon – KFJ333V Richard Winter – Chevette Hatch – SGW623X Kevin Bricknall – Opel Manta Hatch – D820LNM We also had a mini club car colouring competition for the children as there was only Brandon we decided to let his friend enter the club colouring competition his name was James he was part of the FD Register, we got a friend’s daughter of Ian Broadway to pick a winner and the winner was James who received a little gift compliments of myself and Beth and the runner up which of course was Brandon received some money to get himself an ice cream. It just leaves me to say a special thank you to everyone who contributed to this year’s billing which was another success for our club and our cars. All The Best Richard Watt.